The opportunity to be a parent is a gift. I consider it to be a very precious gift. On days when I am not appreciating that gift as much as a should, I think about friends who struggle to get pregnant, or who have lost a child, or who have a child that is experiencing challenges, and then I am much more grateful. There are days as a parent when I am bored or tired or frustrated... and sometimes I feel all three at the same time. There are other days when I am enthusiastic, full of energy, and so creative. I wish I could bottle up all the emotions on the amazing days so that I could give myself an injection on the ho hum sort of days. Do you ever feel like that? How do you get yourself out of a funk when you're exhausted mentally, physically, or emotionally as a parent? I have decided that for me, it is important to capture the precious moments I experience as a parent in some way. I have a twin sister. We were born five minutes apart (I am the oldest :)). She is my best friend and I think we talk on the phone pretty much every day for at least 20 minutes... if not an hour or two. Besides my husband (and the grandparents) she is the one who I talk to the most about my kids and the craziness of parenting. We share silly antics that our kids do, things we are proud of about them, things that annoy us... whatever... but as we talk about them, the events are captured. Talking about the mundane or exceptional parts of our day actually helps me reflect on my own parenting abilities, learn from my mistakes, and resolve to be a little better. Talking to someone else also gives me a fresh perspective and helps me have a broader view about the importance of what I am doing as a parent. I record all sorts of things on this blog and then I also have a personal family blog where I write about special events or post goofy videos of my kids or silly stories that I want to remember. I also used to keep a handwritten journal or a computer journal where I would write more detailed things. One of my favorite ways to record precious moments is by keeping a gratitude journal. As a teacher of kids with autism a few years ago, I had one particularly hard student. He threw terrible tantrums, injured me, and made work-life really exhausting. I began writing down simple things that I was grateful for at the end of each day. One day I wrote that I was grateful he sat in his chair for most of the class time. Another day I wrote that I was grateful he had only pulled a few strands of hair out of my head when he attacked me instead of a whole chunk. When I started my gratitude journal I was ready to change jobs and move far away. As I began to notice more and more positive things, my attitude completely changed... and you know what? So did he. Similarly, at the end of the day when I blog or write about my day with my kids, I tend to notice more and more of the positive things that I may not have noticed during the heat of the moment during the day. Once the kids are in bed, I remember so many wonderful things about them and I can't wait for them to wake up! Writing them down and then having them to look back at on harder days, really makes a difference for me. I think I need to start reflecting during the middle of the day too... so maybe I'll be even kinder! I take a lot of pictures. I feel like my kids are growing up too fast and photos are a way for me to remember the moments we spend together. When I don't have my camera or my phone close by (which is rare), then I take a pause and snap a mental picture... that I pray will stay with me. There are definitely some moments of parenthood that I don't want to have documented... but there are far too many that I just hope I can hold on to because they are so sweet. For example, my little daughter gives me hugs about 400 times a day. She is in love with mama right now. No one is ever around to capture her sneaking up behind me to give me a hug or her little legs running towards me and then grabbing my knees and hugging them and not letting go. It is seriously adorable. I never want to forget it. Do you journal, take photos, or blog? Or do something else to record your parenting journey? 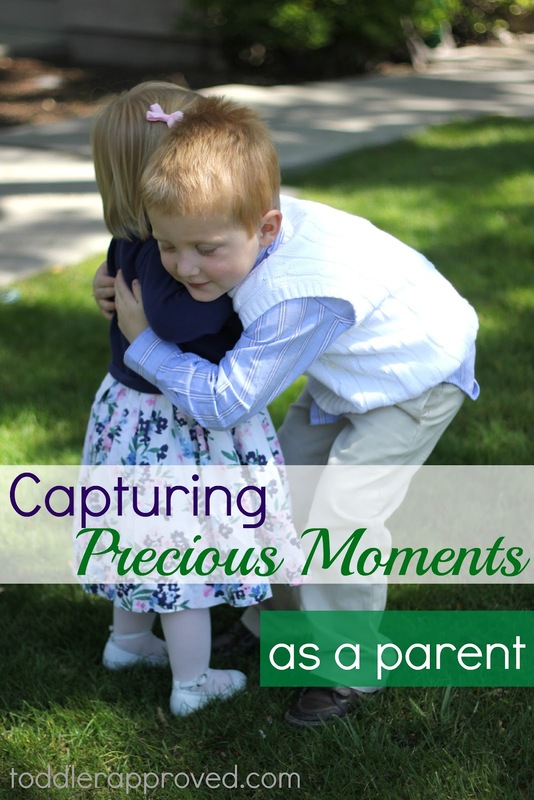 How do you capture precious moments as a parent? What is your favorite mental picture you've taken recently? What is a memory you have of your kids that you hope you never forget? If you have a special moment captured somewhere and would like to share, I'd love to see it. Just leave a note, a link, or share a story in the comments. I think by sharing the precious moments you experience as a parent again and again, they are carved even deeper into your heart. Have a Happy Sunday! I hope your day today is filled with many precious moments! I am getting so excited for next week's Virtual Book Club for Kids, so if you haven't checked it out yet, head on over. We would love you all to join us! Thank you for sharing! I'd a problem with my PC last few weeks. Some of data are in bad sector, which means they are high risk missing! And most make me sad is most of pictures of my kids are there! Until today, I'm still trying to repair it, but I don't really want to expect much. When I read your post today, I was encouraged. I'm sure that I still have a lot of mental pictures, the days I won't forget with my kids. And I thank God that I still can see my child everyday. Although in the end the pictures are disappear, I know that I will have other precious moments in the days to come. Thank you! thank you for sharing this post. i needed it. i love looking back at pics where ill be able to fully appreciate them or bedtime (love that quote) but yes. while they are screaming in the background as im trying to comment: not so much. but those are some good tips to give me that "dose of happy energy" that i need. thanks for being an awesome mom!